INDEPENDENT TD MATTIE McGrath has slammed members of the Dáil Technical Group after he was removed from two Oireachtas committees of which he was a member, claiming it’s because of his pro-life views. The Dáil today agreed to a decision by the grouping of independent and smaller party TDs to remove the Tipperary South deputy from both the Health and Transport committees, replacing him with Clare Daly and Mick Wallace respectively. McGrath described it as an “undemocratic and despicable action” which “reflects extremely poorly on the willingness of some members of the Technical Group to listen to any kind of view which deviates from their own”. However, the Technical Group whip, Kildare North TD Catherine Murphy, said that McGrath has not attended the weekly meetings of the group since July 2013. McGrath has also refused to pay monthly dues for the employment of two people as coordinators for the group since July. “Members of the group were seeking committee places,” Murphy said in a brief statement to TheJournal.ie. However, McGrath told this website that he is “getting no service, so I am not paying” and claimed that the €230 a month he had been paying towards employing staff for the group had gone up to €258 a month. 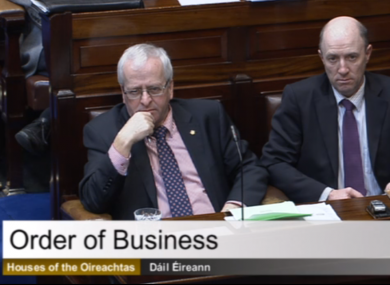 During the debate on the matter in the Dáil earlier, independent TD and Technical Group member Stephen Donnelly asked the Ceann Comhairle to confirm that no member of the group was allowed to speak which Seán Barrett duly confirmed. This was an attempt to point out that the group could not outline its reasons for removing McGrath from the two committees. McGrath said his removal and replacement with Daly and Wallace, both of whom supported the abortion bill, was an attempt to tip the balance in favour of pro-choice views. “How can I see this as anything but an attempt to tip the ideological balance away to a position more suited to the proposers of the motion?” he said. Separately, the Dáil also voted through a measure preventing opposition TDs from tabling duplicate bills to increase the chances of them being debated. This followed a recent dispute over Luke Ming Flanagan’s tabling of a bill banning the construction of wind turbines which was identical to that previously tabled by Labour backbencher Willie Penrose. Email “‘Liberals don’t like my thinking’: TD claims he was ousted over abortion views”. Feedback on “‘Liberals don’t like my thinking’: TD claims he was ousted over abortion views”.